To say that bastions functioned as flanks into an advancing enemy does not fully describe their utility. Those bastions also elevated and protected the artillery of the besieged, permitting them the advantage of firing down from behind cover. 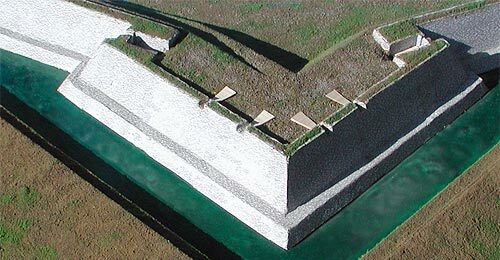 If a bastion's parapet was low enough, like under a meter, cannon barrels could thrust over the top. But that did not afford much protection for the cannoneers. Better was the parapet that was near two meters high. Unable to fire over their protection, the men had to fire their cannon through slots in the parapet. 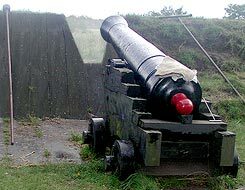 These slots were termed embrasures, which were wider outside than inside, providing both protection and the ability to aim the cannon within the angle formed. Each cannon did not simply rest on the ground. Rather, a wooden floor was made for each, usually trapezoidal in shape. While keeping the weapon out of the mud, the platform facilitated lateral movement of the gun to improve and speed aim. To permit the barrel to be depressed sufficiently to shoot down on swarming attackers, the platform was angled slightly to make its rear higher than the front. This also allowed gravity to help absorb the cannon's recoil. Artillery pieces set on the static bastions were not required to move but little. Therefore, a big-wheeled carriage with long trail was not necessary. A more box-like carriage with small wheels worked as well, and was simpler and easier to construct. You likely have seen images of this carriage type in movies of sailing-era adventures, and you could have seen the same deployed in the defense of some artillery forts.